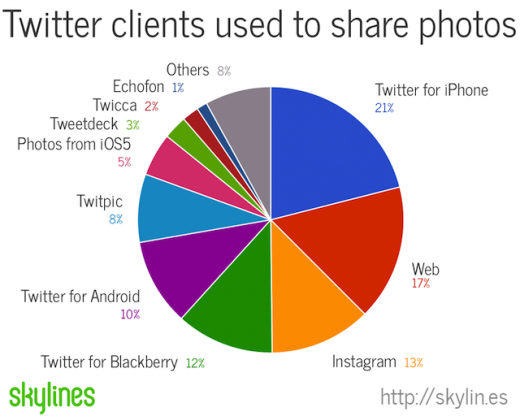 The Next Web has shared the results of a study that shows iOS 5 is now is the 7th biggest Twitter photo client; and 39% of all photos posted to Twitter come from an iOS device. Combined, the iPhone accounts for at least 39% of all photos posted to Twitter, largely due to Instagram and Twitter for iPhone. There are a few percent in the smaller categories like Echofon, Others and Tweetdeck that aren’t able to be attributed solely to iOS, as they are multiplatform. With the integration of Twitter into iOS 5, not only did Twitter score themselves a deep toehold on one of the best mobile operating systems around, but it also nearly guaranteed itself longevity. A chart of twitter clients used to upload photos to twitter can be seen below.